A scene from the Star Wars day at the Hildreds Centre, Skegness. A shopping centre in Skegness welcomed thousands of extra visitors when it ran a Star Wars-inspired Jedi Training Academy on Saturday. 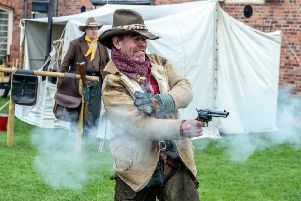 The event at the Hildreds Centre was billed as ‘Revenge of the Fifth’ – a play on the date and title of the sixth Star Wars film, Revenge of the Sith, made in the spirit of the more familiar calendar-based Star Wars pun, May the Fourth be with you. While perhaps not ‘a galaxy far, far away’, some travelled from as far as 200 miles away for the event and, in all, 300 gained the rank of Jedi Knight.